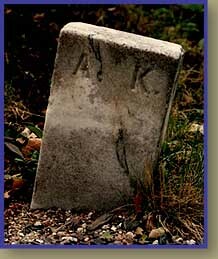 Tragedy is no stranger in small town life and one of the most famous cases in Bear River history is that of the death of Annie Kempton, a vivacious 15 year old school girl, whose life was tragically cut short when she was attacked and murdered in her own home on January 27, 1896 by an older, would-be suitor, Peter Wheeler. Annie Kempton was an attractive and well liked young girl who lived with her parents on the Isaac Kempton homestead located on the steep and curving Parker Road, only about 400 feet away from her assailant, Peter Wheeler�s residence. Wheeler, whose roots are somewhat obscure, first came to Bear River about 12 years earlier and lived with one Tilly Comeau, a very hardworking and never married woman who raised her four children alone. Wheeler worked for a number of years in odd jobs and occasionally took to the sea to support himself. This fateful night, Tilly Comeau was told by Peter Wheeler, that Annie had another friend coming for the night, thus making it unnecessary for Tilly Comeau to stay with the young girl. Thus an evil plan was set into motion by Wheeler who had some ideas of his own relating to his desire for the young girl. Annie never arrived at that party. 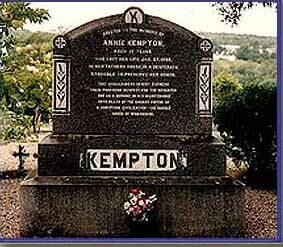 The body of Annie Kempton was discovered on the morning of January 28, 1896, by Peter Wheeler, 27 and Harding Benson. Quickly summoning the authorities, several local doctors and county authorities descended on the scene where they found Annie�s lifeless body lying on the floor, her throat slashed in three places and the house was a scene of disarray, showing the signs of a violent struggle. Dishes were broken and furniture overturned and blood smears were found on a number of surfaces. Amounts of blood were found on Wheeler�s clothing, to which he countered were the result of killing a rabbit during a recent hunting trip. Many other suspicions lit upon Peter Wheeler as evidence given during the inquest into Annie�s death started stacking up. Tilly Comeau, with whom Peter Wheeler lived, told the investigation she would have stayed with Annie that night if she hadn�t been told by Peter Wheeler that Annie had another villager staying with her. His statement to Comeau turned out to be completely untrue. The young lady who was supposed to be staying with Annie had never ever been approached to do so. On the dreadful night Annie Kempton was alone in her home, as her father was away in the woods working for a number of days. Her mother was in the United States visiting Annie�s two sisters. Occasionally when her parents were away, Annie made arrangements with local friends in the village and often with Tilly Comeau, for them to stay with her overnight to keep her company. Peter Wheeler was then arrested and the murder trial was slated for Supreme Court in June of 1896. As the trial unfolded, it became more and more apparent that Peter Wheeler was unable to give a coherent account of his movements and the events surrounding Annie�s murder. He changed his story many times and even after being found guilty and writing a full confession to the Digby Courier, which was reprinted in its entirety, Wheeler changed the details of the account and his confession as well, adding some details and removing others as time went by. Wheeler was sentenced to be executed on September 8, 1896 and the added precaution of moving forward the execution by a number of hours was taken because of the rumour of crowds of people descending on the courthouse to witness the event, even though it was not a public execution and the scaffolding had been built with walls around it to prevent the public from viewing. Peter Wheeler was hung by the neck until dead at 2:31 a.m. that morning. A huge monument was erected in the public square of Mount Hope Cemetery in Bear River. Subscription lists of those who made contributions to this monument are still in existence, with contributions from all over the province of Nova Scotia as well as donations from parts of New Brunswick. The inscription is to the memory of a young lady......who sacrificed her life in a desperate struggle to preserve her honour....in her maintenance unto death of the highest virtue of a Christian civilization - the sacred honour of womanhood. 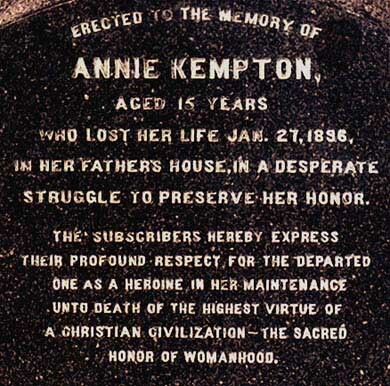 Annie Kempton�s funeral took place on her 15th birthday, January 30, 1896.